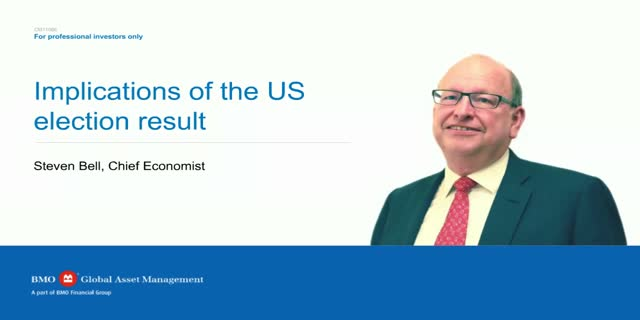 Steven examines the global economic and market implications of the US presidential election result. Over 450 holdings, a 150 year history and a global investment remit. Paul will discuss the current positioning of F&C Investment Trust, the world’s oldest investment trust, and identify where he sees current opportunities. The QE regime has been good for fixed income and fixed income investors, but if it's on the turn, what does it mean for bonds and if you are investing in bonds, do you want to go passive? We’d be delighted if you could join Anthony Willis and Scott Spencer on the 3 April at 11am for the second of our 2019 multi-manager webinars. After reflecting on the first quarter of 2019 we will share our views on what to look out for in Q2, and we might even discuss the impacts and outcomes of Brexit. Morgane discusses the macro and ETF trends emerging from 2018 and expected to roll into 2019, including emerging market fundamentals, risk on/off attitudes and how to de-risk portfolios while the US$’s appeal loses momentum. With the ongoing political challenges and volatility in the wider equity markets, Guy outlines why he still sees the potential for positive returns from UK direct property in 2019. Guy will talk through the fund’s positioning – with low exposure to high street retail and central London offices - and explain why quality long-term, income-producing assets continue to have performance potential. Steven Bell discusses his thoughts on potential macroeconomic events in 2019 and what they mean for the global economy. We’d be delighted if you could join Anthony Willis and Gary Potter on the 4 January at 11.30am for the first of our 2019 multi-manager webinars. After reflecting on 2018 we’ll cast our eyes towards 2019, exploring some of the likely themes for economies and markets, highlighting how our portfolios are positioned to take advantage of opportunities in the coming year. This session will be hosted by Vicki Bakhshi, Director, in the Responsible Investment team. Catherine Hoyle, Associate Analyst, will explain the background and key takeaways of the ESG disclosure at mid-cap companies project, and Thomas Hassl, Senior Associate Analyst, will give an update on Climate Action 100+ and how this has influenced the Responsible Investment team’s engagement with high-emitting companies. All participants will be able to submit questions during the webinar, and there will be the option to replay the webinar in full. Please register if you plan to attend. We very much hope that you will join us. Passive Fixed Income strategies are used by investors to get a broad base in expensive exposure to fixed income. But what are the limitations and what are the opportunities? An outlook of increasing volatility and potential economic slowdown makes the case for a defensive approach to equities. With income from traditional sources still difficult to come by, and higher yielding strategies carrying risk, we discuss an approach to achieving higher income with comparatively low risk through the use of covered calls within an ETF structure. We are renaming our funds to make things simpler. With Brexit looming and with uncertainty permeating markets, what are the advantages of holding commercial property? Topics also covered include foreign investment, property performance in rising rates and the key drivers for commercial property in 2018. Although we are late in the business cycle, income still remains crucial. With office rents rising everywhere but London, and the impact of Brexit along with the devaluation of sterling, this should not always be viewed as a negative as it can attract global investors. Marcus Phayre-Mudge will discuss the dynamic shifts in the retail space, the winners and the losers, as well as the rise in alternatives, such as investment in self-storage, budget hotels and student accommodation. European Equities have long been the developed market laggards with economic and political uncertainty providing the backdrop of uninspired fundamentals. But is this unfair and is it changing? Join Paul Green and Scott Spencer on 11 October 2018 as they discuss their findings following research trips in both Japan and New York. In addition to the usual updates, the team will also reflect on the previous quarter and consider what might lie ahead for markets in the final three months of the year. The outlook of a faster convergence of the US economy towards full capacity, ongoing trade disputes and persistent geopolitical risks makes the case for a gradual rotation towards defensive strategies. Morgane Delledonne reviews some ETF strategies to adapt to the evolving economic landscape. We are launching a webinar to give our clients greater insight into our voting and engagement activities. In our first of the series, Vicki Bakhshi will present highlights of our voting and engagement activities this year, and Emma Lupton will provide an update on our topical Ocean Plastics project, explaining key findings from our engagement so far. Please register if you plan to attend. All participants will be able to submit questions during the webinar, and there will be the option to replay the webinar in full. BMO Global Asset Management (formerly F&C Investments) is a worldwide investment manager and is part of BMO Financial Group, founded in 1817 as the Bank of Montreal.